1. In medium bowl, whisk together garlic, pineapple juice, coconut milk, lime juice, honey and oil. Place salmon in large zip-top plastic bag, pour marinade over salmon. Seal bag and refrigerate 30 minutes to marinate. 2. Soak skewers in water 20 minutes. Prepare outdoor grill for direct grilling over medium-high heat. Remove salmon from marinade; reserve 1/4 cup marinade. Alternately thread salmon, bell pepper, onion and pineapple onto skewers. 3. Coat grill rack with olive oil; reduce grill heat to medium. Place kabobs on hot grill rack and cook 12 to 16 minutes, or until salmon turns opaque throughout and internal temperature of salmon reaches 145°, rotating kabobs 1/4 turn every 3 to 4 minutes. Remove kabobs from grill and place on large serving plate; keep warm. 4. In small saucepan, heat reserved marinade over medium heat 2 to 3 minutes or until temperature reaches 165°. 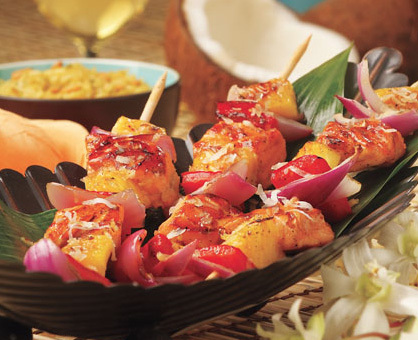 Drizzle marinade over kabobs and sprinkle with toasted coconut. Serve with a side of your favorite rice, if desired. If you have a grilling basket, place skewers in the basket and grill each side for about 6 to 8 minutes.